When I first saw this lacy BCBGeneration Stella Tote handbag, I was drawn to it, but I am not sure if I love it or hate it. The lace overlay fits right in with the 2011 trend of feminine lace and florals. 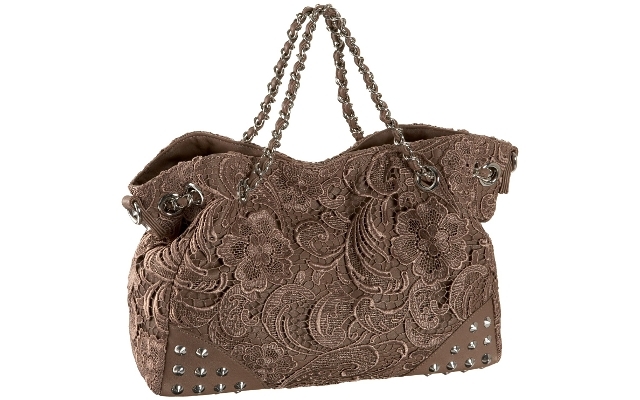 The double chain handles add a touch of Chanel-like class and the silvertone studs gives this bag a little edge. This particular color, Elderberry, gives the bag some sophistication. Why do I have such mixed feelings about this bag? It has all those elements put together, but they do not seem cohesive. That is probably the appeal to most people, but can I pull off a bag like this? It's funky and reminds me of a time when early Madonna and lace-trimmed leggings were a big part of my life. I know lace-trimmed leggings have come back for children and tweens, but I'm 37 . . .